Activity in the huge Bakken field is going home. Home is Montana, where the Bakken was originally discovered. Drilling equipment and crews are moving back across the border from North Dakota—where the Bakken Boom has been the Biggest—boosting Montana’s rig count to 22 from just eight at this time last year. Montana’s Department of Natural Resources and Conservation issued a record 356 oil drilling permits in the first ten months of the year, easily beating the previous record of 313 set in 2005. Note the declining rig count in North Dakota (blue line) contrasted with the rising count in Montana (red line). Thanks to the Federal Reserve Bank of Minneapolis for the figure. In October a Texas company paid $13.5 million for 75,000 acres of oil and gas leases, one of the largest federal lease acquisitions by a single company in Montana in recent years. Several other companies, including Bakken leader Continental, are working to expand the boundaries of the state’s most productive Bakken field, known as Elm Coulee. But geology doesn’t pay attention to state lines… and even though the Bakken boom started with a few good wells in Montana, attention shifted next door after operators decided the geology in North Dakota offered more potential. There is still an immense amount of oil in the Bakken, which means investors can still find ways to profit from this fantastic formation. But instead of coming late to the North Dakota Bakken party, where six years of profits have left slim pickings, a more savvy choice might be to check out the new scene next door. 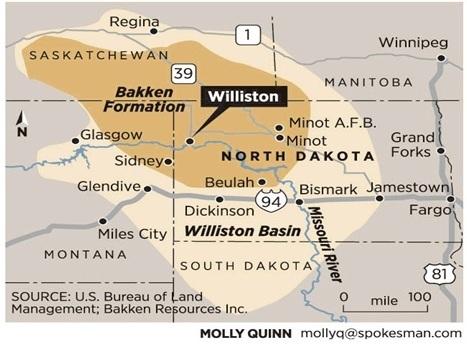 The Bakken is a 200,000-square mile rock unit within the even larger Williston Basin, an ancient inland sea that reaches from southern Saskatchewan to North Dakota and eastern Montana. The Bakken therefore touches four states and provinces, and in the early days of the Bakken boom – way back in 2006 – drilling was fairly evenly split between North Dakota and Montana. So why did North Dakotans get all the fun? Because of geology. The Bakken is generally divided into three stacked layers—Upper, Middle and Lower. The upper and lower layers are organic-rich black shales that gave birth to the formation’s oil. The industry calls those layers “source rocks”. The middle layer is made up of more porous rocks—which also means more holes and less pressure in those rocks—so the oil seeped away from those higher pressure, denser layers, looking to a more porous resting place. The industry calls that the reservoir. And the oil is stuck there in the middle Bakken reservoir. That’s why the Middle Bakken generates the best production volumes…and the Middle Bakken is thickest in North Dakota. In the early days of the Bakken boom, a couple high-volume wells tapped into the Middle Bakken drew almost all of the attention to North Dakota. Did you know that today’s primary oil recovery methods can leave up to 90% of a formation’s oil trapped in the ground?The industry calls this “stranded oil.” For oil producers, it can mean millions of dollars left on the table.Fortunately for them there’s now a technology that can actually produce all this stranded oil… quickly and effectively, with no environmental footprint.In fact it is proven to extend the field life – the lifeblood– of oil fields throughout the world… including today’s massive new shale formations. (This company’s patented technology is being used successfully by clients on 3 continents. )What’s more – with over 200,000 wells in the world that could (and should) use this technology, it could mean an absolute windfall for investors. Click here to get caught up on the whole story. Those few gushing wells in North Dakota sparked a land grab there. Then, because North Dakota requires mineral lease holders to explore their acreages within three years, companies with ground in North Dakota had to spend their money there. And so North Dakota became the Bakken boom ground, with a rig count that climbed from 25 in 2005 to 213 in mid-2012. Meanwhile Montana was largely forgotten, even though the heart of the formation extends across state lines. Now that is starting to change. In recent months, the Montana Bakken has started to steal some of the spotlight. Helping the move is new data showing that geology may be less of an obstacle in Montana than originally thought. Remember, North Dakota produced those gushing Bakken wells because the primary reservoir layer, the Middle Bakken, is thickest within its portion of the Bakken. In Montana the middle layer is thinner, pinched by the Upper and Lower Bakken layers, and geologists thought a thin Middle Bakken would translate into poor recoveries and flow rates. But recently, several explorers have had success with wells that targeted the Upper Bakken. The wells don’t have the big initial flow rates as in North Dakota, but they declined more slowly and had a better oil-to-gas ratios (98% oil) than normal, Middle Bakken wells. The result is making geologists rethink the potential of the Upper Bakken – and therefore the potential of the entire Montana Bakken. A productive Upper Bakken is particularly significant in Elm Coulee, the best-producing part of the Montana Bakken to date. In this area the Middle Bakken becomes very thin, pinched out by a broad Upper Bakken. The result is a world-class source rock – remember that the organic-rich Upper Bakken is the source rock for the formation’s oil – with no nearby reservoir. That means all the oil has remained in place. Jim Halverson, a geologist with the Montana Board of Oil and Gas, is cautiously optimistic about the potential for a Montana Bakken boom. However, Halverson is not letting himself get carried away with dreams of a major Montana Bakken boom. Next Story: Can the mighty Bakken reach 1 million barrels a day production… OR is the boom soon to plateau? Next post: Bakken Oil Production: Can the Giant Oil Formation Reach 1 Million Barrels a Day?